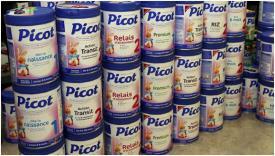 Picot AR infant formula produced by Lactalis Nutrition Sante of France is responsible for outbreaks of salmonellosis in infants. Affected product contaminated with Salmonella Poona manufactured by Spanish subsidiary, Savencia SA was responsible for infection. To date four babies have been diagnosed with salmonellosis attributed to contaminated product that has been recalled. Powered infant milk was responsible for an extensive outbreak of Salmonella Poona in 2010. Lactalis infant formula was responsible close to 40 cases of Salmonella Agona in France but cases occurred in 80 nations to which consignments of infant formula were exported.